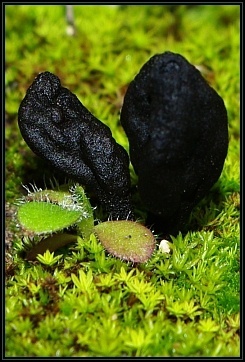 Description: Solitary to gregarious, small sized 'earth tongues', clavate 'head' (irregularly shaped) with a short stipe, terrestrial amongst moss, coloured a dull but very dark brown, almost black, without hairs or setae on stipe. 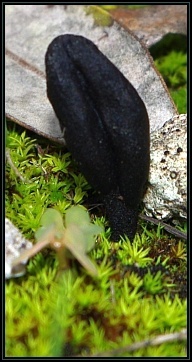 This species is dry not glutinous. Size range of collected specimens: 15-23mm x 5-7mm (upper part). 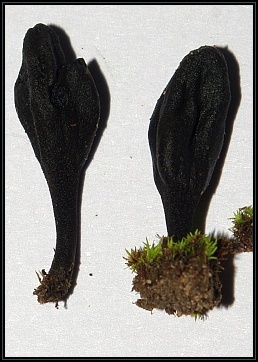 Paraphyses: Thin, hyaline, sparsly septate, often with inflated tips, ocassionally pointed tips, generally recurved at the tips. Diameter: 3.1-4.2µm, tips up to 6.7µm. 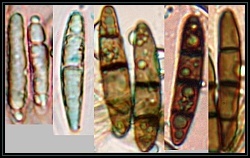 Ascospores: Initially aseptate and colourless, becoming 3-septate and dark brown in colour with time. 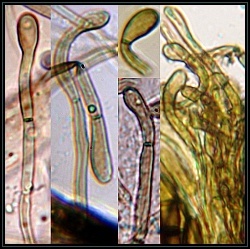 In literature mature spores are reported to be up to 12-septate (original description).